As most of you know, today is World Book Night, the motto of which is Spreading the Love of Reading Person to Person. To help celebrate this great event, HaperCollins Publishers has given me the chance to host a giveaway. 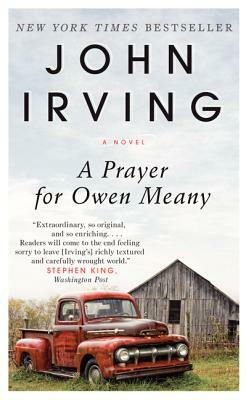 The book I'm giving away is A Prayer for Owen Meany, John Irving’s seventh novel. I'm a huge John Irving fan, although I haven't yet read this book, just out in a new paperback edition as well as in eBook form. "I am doomed to remember a boy with a wrecked voice—not because of his voice, or because he was the smallest person I ever knew, or even because he was the instrument of my mother's death, but because he is the reason I believe in God; I am a Christian because of Owen Meany." Doesn't that sound like a must-read? About the Author: John Irving has been nominated for a National Book Award three times—winning once, in 1980, for the novel The World According to Garp. In 1992, Irving was inducted into the National Wrestling Hall of Fame in Stillwater, Oklahoma. In 2000, he won the Oscar for Best Adapted Screenplay for The Cider House Rules. In 2001, he was elected to the American Academy of Arts and Letters. The Giveaway: This giveaway is open to anyone with a US mailing address. To enter, simply fill out the following form. I'll pick a winner via a random number generator on May 2. I dont want to be entered, but I have to say....I love this book also. And I am also giving this book away tonight for World Book Night! So excited!! And it's a rainy day...perfect time for someone to start a new book!! This is one of my favorite books of all time. You must read it! I've never read this ..
Yay! I am giving away The Namesake, and am looking forward to passing it out. Such a cool thing to do, and I can't wait to get the book into more reader's hands! You got a great pick too! I have read and loved this one. I signed up for the John Irving giveaway. But was really interested in your review of Anne Quindlen's new book. I hope to convince my book club to put it on their list for fall and winter. After reading your review, I am definitely going to gift it to my daughter for her 48th birthday. I think she will love it.